BlackBeards Resort is located in the private and gated beachside community of Costambar, on the North Coast of the Dominican Republic. Costambar is a short 30 minute cab ride from the International Airport of Puerto Plata. Puerto Plata is easily accessible from any Airport in the United States, and for that matter, from anywhere in the world. You want to fly to Puerto Plata, Dominican Republic (Airport Code is: POP and is closest to us) or to Santiago, Dominican Republic (Airport code is STI and is about 1 ½ hours away) You will need to buy a Tourist Card (US $10.00) to enter the Dominican Republic. Your airline might sell these in your country but if not you can buy them in the immigration area at the airport. Costambar is a convenient 30 minute cab ride from the Puerto Plata airport. Cost is $45 one-way – less (per person) if we are picking up more guests. Santiago airport is approximately 1 ½ hours away from us and we now provide transportation from there. 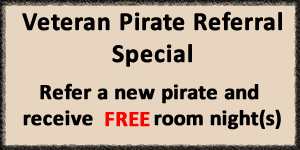 Cost is $90.00 one way per person and drops to $50 per person for 2 and less if we are picking up more guests. We will be happy to pre-arrange your transportation from the airport – simply call or e-mail us with your travel schedule. To get to Blackbeards Resort, known here as “HOTEL BARBA NEGRA”, turn right as you leave the airport. Take the main highway out of Puerto Plata going toward Santiago . As you leave Puerto Plata, there is a Texaco gas station on the right hand side. About 3/4 mile down the road, after you cross a bridge, you want to take the next right. There is a sign that says ‘COSTAMBAR’. Stay on this road and it will bring you to the main entrance to the community. Once you are through the gated entrance, keep on the main road. You will pass Jenny's Supermarket on the right hand side and a pharmacy on the left hand side. About 300 yards farther on, the road splits. Take the left fork and go past the Taxi stand. Turn right at the first road. Follow this road and turn right at the 3rd street (Calle Enriquillo). We are about 200 yards up on the right hand side. Our hotel sign will be on your left. As you leave Santiago , take the main highway to Navarette/Puerto Plata. At Navarette, the highway forks. Take the road to Puerto Plata. As you get close to Puerto Plata, you will see the entrance to Playa Cofresi /Ocean World on the left hand side. About a mile and a half farther on, you will see a stop light and the University on your left side. Two streets past the University turn left. This will take you into Costambar. Once you are through the gated entrance, keep on the main road. You will pass Jenny's Supermarket on the right hand side and Pharmacy on the left hand side. About 300 yards farther on, the road splits. Take the left fork and go past the Taxi stand. Turn right at the first road. Follow this road and turn right at the 3rd street ( Calle Enriquillo ). We are about 100 yards up on the right hand side. There are 2 ways that you can get to Puerto Plata from Santo Domingo. 1. You can take a taxi from the airport to Puerto Plata. This will cost you about $180. 2. You can take a taxi from the airport to the Caribe Bus Tours Station in Santo Domingo. From the airport to Caribe Tours the price is about $25. Buses leave	every hour on the hour from 6:00am to 6:00pm . The cost is about $10. From the Caribe Tours Station in Puerto Plata, you take a taxi to the hotel. The cost is about $17.00. 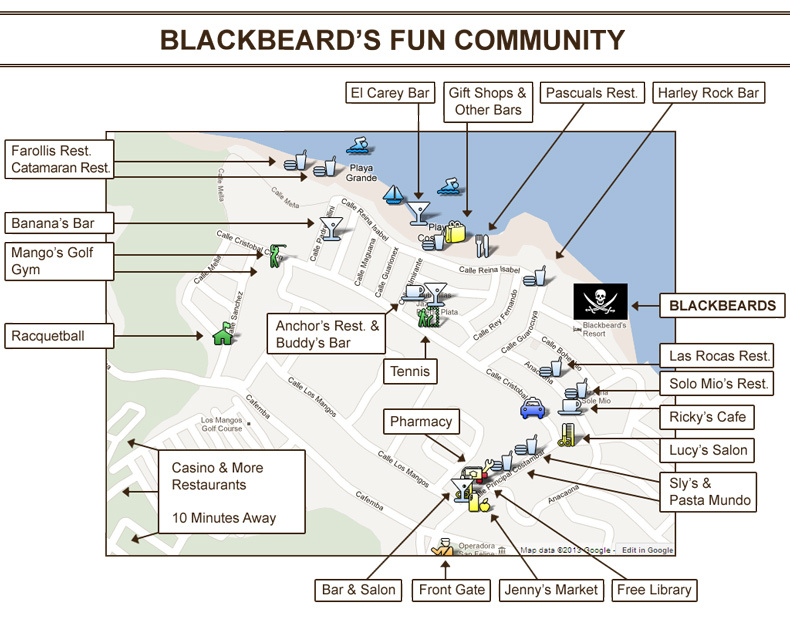 Here are a few maps of the Dominican Republic, Puerto Plata and BlackBeards. Below are some airlines that have flights to the two airports near Blackbeards: Puerto Plata (POP) and Santiago (STI). Some are charter flights and some are scheduled flights. Check with your travel agent or a General Travel Site listed below for more options.